Whether you’re driving your hired van around Doncaster or further afield, there are certain considerations you should give thought to during the winter months. When it comes to snow, ice or wet hazardous conditions, preparation can be the difference between making it to your destination successfully or not. Here at Exchange Hire Services Ltd, we’ve helped many van hire customers in Doncaster through the winter months so here’s our top tips for winter driving. Of course, when hiring a van with Exchange Hire Services Ltd all our hire vehicles are fully maintained and serviced by our experienced mechanics on and off site so our customers can have total confidence in their hire vehicle. Before setting off, check for severe weather warnings. You can keep up-to-date with the weather by checking the BBC News, your phones weather app or more appropriately local news such as the Doncaster Free Press. Winter driving can be unpredictable, so with this in mind it’s sensible to ensure you have more fuel than is needed for a journey. You must defrost / remove snow from your vehicle before you set off on a journey – that is the law! The majority of modern vans have heated windows and mirrors to help you defrost or demist easily. You can help to prevent snow and ice build up and save time by using a vehicle windshield cover. If not, don’t forget to keep your de-icer / scraper handy! Don’t just jump in a vehicle and expect to learn the controls as you go – that is not a sensible approach in winter. Winter driving can present many hazards, for example, if fog appears quickly you’ll want to know how to switch on the fog lights without distracting yourself whilst driving. Before setting off, ensure you know how to operate all the lights, indicators, windscreen wiper controls and hazard signals. If the weather is forecast to take a turn for the worst we’d recommend packing these essential items regardless of the length of your journey. 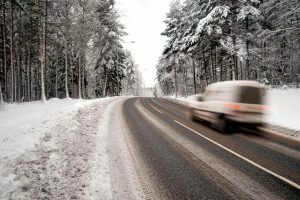 Regardless of your usual driving abilities, you may need to rethink some of your natural driving techniques as driving in wintery conditions can present many challenges. The best advice we can offer to you is to be patient with your own driving and with other road users. If you feel the van starting to spin, remove your foot off the accelerator and steer into the skid. Once you are back in control, quickly return your steering wheel to its default position. Are you thinking about hiring a van in Doncaster? Whether you are moving house or simply need a vehicle to get around in we have a vast range of vehicles to suit your every need all year round. For van hire in Doncaster: use our online enquiry form or call us on 01302 340000 to book your vehicle today.